Valentine’s Day is a great day to splurge a little, as you celebrate your love, but the splurge doesn’t have to destroy your digestive system! 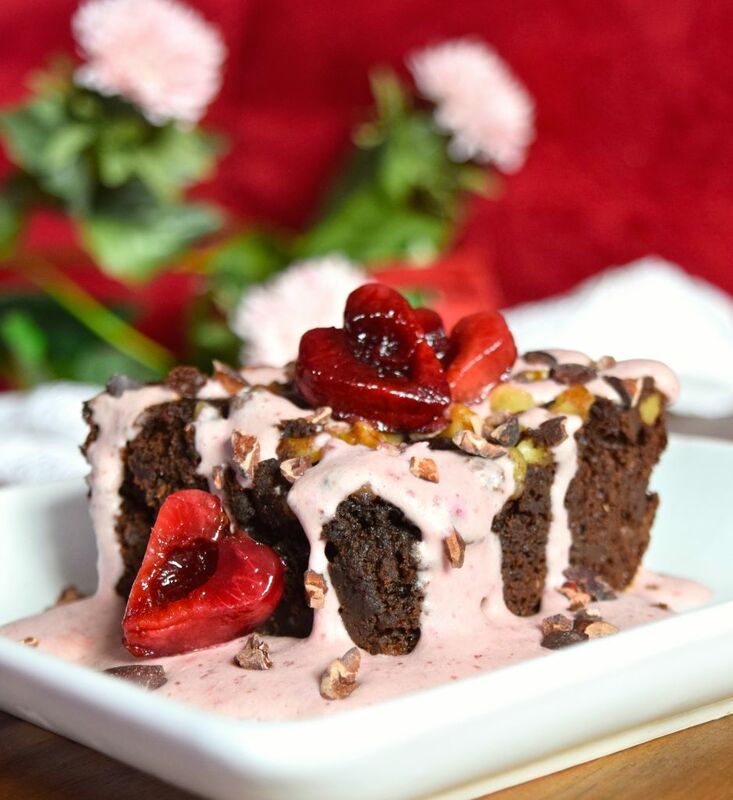 If you’re looking for a healthy, decadent dessert that is easy to make, try serving this Vegan Cherry Cream on top of my Sweet Potato Paleo Brownies. It’s rich and creamy, with a hint of tartness, and there are only two ingredients in the cherry cream! I’ve talked a lot about why I think coconut is an essential part of the anti-diabetic diet on this blog, but did you know that cherries are also beneficial in the battle? They come in at a mere 22 on the Glycemic Index, which is way lower than most other fruits (grapes are 46), and some studies have shown that they may help increase insulin sensitivity. Cherries are also high in fiber and contain phytochemicals that reduce inflammation. Eating cherries is a great way to satisfy your sweet tooth! For more on cherries, check out this article. 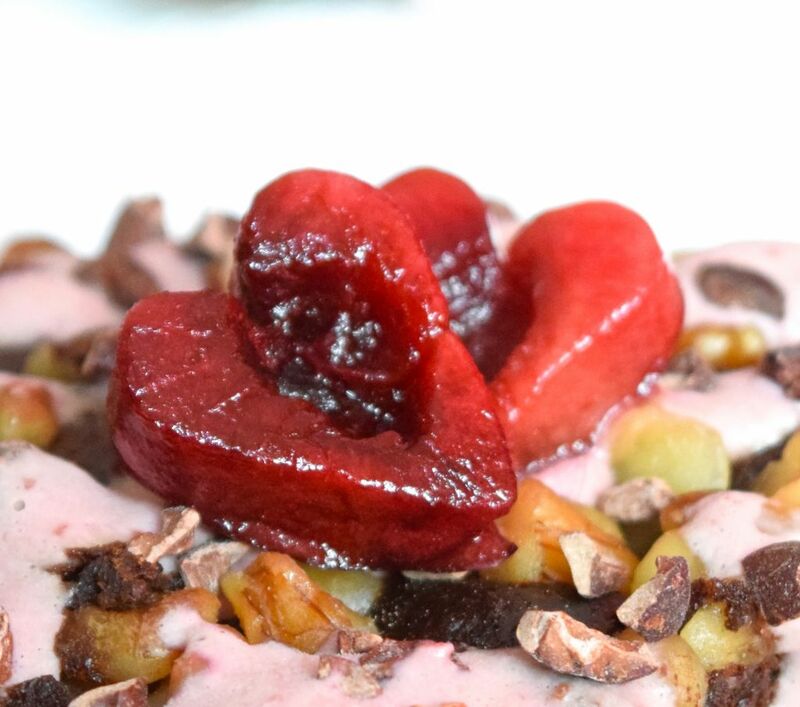 I drizzled the cream on top of the brownies, then garnished it with frozen cherry hearts, raw cacao nibs , and walnuts. To make the hearts, simply cut a large frozen cherry in half, then use a tiny heart cookie cutter on it. Make sure to press the inside of the cherry, and use your fingers to press the skin down and cut it evenly. If you haven’t tried raw cacao nibs, I highly recommend them! They are SO tasty, and super healthy. Before we get to the recipe for the Vegan Cherry Cream, I want to invite you to join with others who are making healthy changes. I’d love to walk alongside you in your journey towards wholeness and health! Jesus said, “I have come that they may have life, and have it to the full!” Freedom from food addictions is part of having a truly full life. Place both ingredients in the blender and run it on high, until it is your desired consistency. If you’d like a thicker sauce try thawing and draining the cherries first. You can also place the can of cream in the fridge for a couple hours before you use it. The coconut cream will separate from the coconut water. Just use the thick cream part. Serve with the brownies, or any other dessert you want to make fancier. 3 Responses to "Vegan Cherry Cream"
I really want to make this for my roommates and friends tomorrow to put on top of some delicious black bean brownies. However one of my roommates has an allergy to cherries, so I was thinking about using strawberries instead. Do you think that would work as well, or would it change the consistency? I think it would be really good with the strawberries! Good idea! I’ve only tried this with frozen cherries, but I actually think unfrozen fruit would allow the texture to be thicker (which I prefer), because the frozen ones get so wet when they thaw. I bet the strawberries will give it a great consistency. You can also make the little heart cutouts out of the strawberries =).